1.Egyptian Handball team wins World Champion Sweden 26:25 after a spectacular performance by the two teams. In Group B, Egypt is now third in the group with two points after its stunning final goal. Egypt will compete vs. Poland on August 11 in its 3rd match in Group B. The first match ended in a Slovenian victory. Slovenia and Germany top the group with 4 points each. 2. In Men’s Volleyball, Egypt beat Cuba 3-0 claiming its victory after having lost the opening match to Poland 3-0 earlier this week in Pool B. Argentina No 5 World rank, currently tops the pool with 6 points. 3. Fencer Ayman Fayez stuns London 2012 gold medalist Ruben Limardo Gascon from Venzuela 15-5 to reach the table of 16 in the men’s fencing event. Fayez then departed in the table of 16 by French Grumier Gauthier 15-9 in the Men’s Épée Individual Table of 16. 4. In boxing, Hosam Bakr Abdin (30) stuns Merven Clair from Mauritius (23) in the Men’s middle 75 kg boxing event 3-0. Hosam Bakr will compete against fellow African Dieudonne Wilfried Seyi Ntsengue from Cameroon in the round of 16 of the event on Friday August 12. All hopes are up on Hosam Bakr Abdein to advance to the semi-finals. 4. 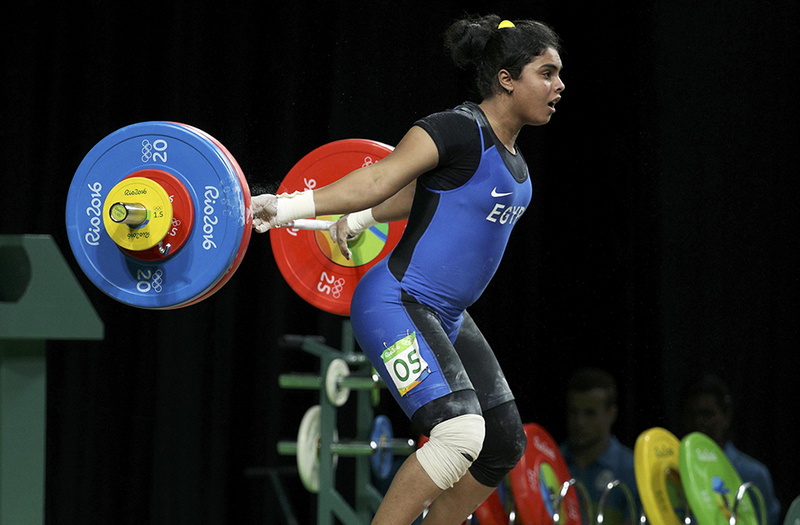 In Women’s Weightlifting 63kg, Egyptian Esraa Ahmed ranked 7th after lifting 216kg, China’s Deng Wei went home with an Olympic gold with a mighty 262kg. 5. In women’s Single Sculls Rowing, the 18 year old Nadia Negm ranked 24 in the quarter finals with a timing of 8:25.7. Nadia will appear today (Aug 10th) in semi-final C/D. 6. 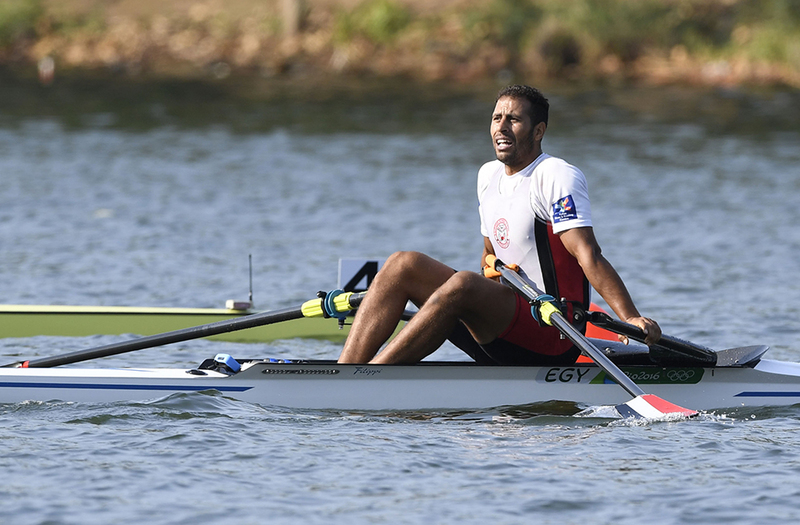 In men’s Single Sculls Rowing event, Abdel Khalek Elbana advanced to the semi-finals after a strong performance timing 6:50:82m in harsh weather condition. At 14:00 Sami Abdel Fattah (36) will compete in the 50m pistol event. In individual women’s archery Reem Mansour will participate at 14:26, followed by Mohamed Ihab in weightlifting 77kg, Egypt is hoping for a great performance and ranking from Ihab. 3 young ladies will compete shortly after in fencing, rowing and sailing – Noura Mohamed (16:30), Nadia Negm (17:30) and Sara Elsayed (18:05) respectively. Ahmed Ragab in sailing (18:05) and Mohamed Khaled Hussain in swimming (19:05) 200m medley men will finish the day.